England's Parag Patel and David Luckman won Commonwealth games gold in the Queen's Prize Pairs shooting in a Home Nations 1-2-3. The English duo took gold in the non-Olympic event at the Belmont Full Bore Range. 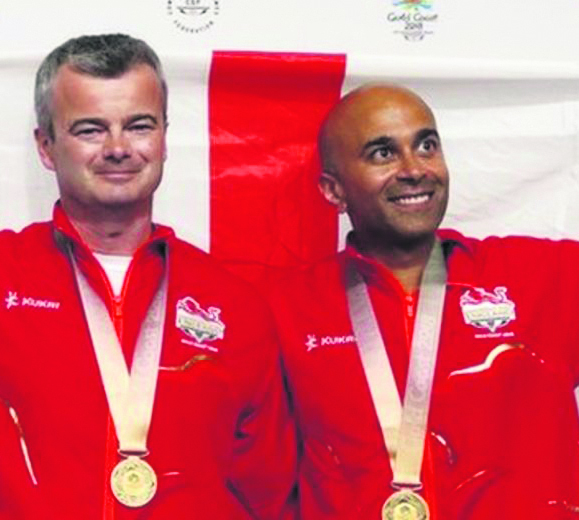 Patel and Luckman also won the full bore pairs event at Glasgow 2014. Luckman, 41, winner of the 2014 individual event, and seven-time medal winner Patel, 42, were third behind Wales heading into the final distance. In the event, competitors fire at targets over five distances. Wales' Chris Watson and Gareth Morris took silver and Scotland's Alex Walker and Ian Shaw bronze. The event received lot of attention due to the participation of Robert Pitcairn, who was born in June 1938 and is the oldest athlete in the history of the Games. The Canadian finished eighth with his partner Nicole Rossignol, but it is his colourful life story which captured the imagination. Pitcairn was introduced to the sport as an air force cadet. He joined in 1956 and became a pilot. He foiled a hijacking attempt in 1974, when piloting a CP Air flight from Winnipeg carrying 120 passengers. There was another Home Nations clean sweep of the podium in the men's 50m rifle prone final, won by David Phelps of Wales. Scotland's Neil Stirton took silver and Kenneth Parr of England claimed bronze.